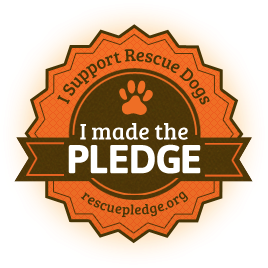 Take The Dog Rescue Pledge! We're thrilled to promote this great online initiative from P. L. 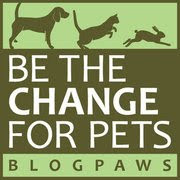 A.Y., Pet Lifestyles and You, and Nebo, an interactive marketing company, in conjunction with Petfinder.com, that together with you, me and hopefully hundreds of thousands of pet lovers will help spread the good word about pet adoption. And you know, this is only possible if we help to educate people about shelter pets: there remains an overwhelming negative public perception of these beautiful orphaned animals-that they're somehow broken, or "unclean" and/or more difficult to train. And although none of these stereotypes is true, they persist. In fact, only a small percentage of people in the United States will ever walk into a pet shelter. So we're asking you to Take the Pledge to help enhance the perception of rescue animals and encourage people to adopt their next pet from a shelter. 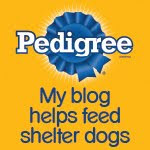 Won't you join us by taking The Pledge and prominently displaying this lovely badge on your blog? And while you're at it, check out The Pledge's Facebook page, give it a "Like' and keep up with this powerful movement! Hear, hear. We agree education is part of the solution to the problem. We hope it makes a difference. Have a fabulous Friday.